Dana Carvey stopped by the The Late Show with Stephen Colbert and he has moved on from impersonating presidents to impersonating the president's new National Security Advisor, John Bolton. Carvey portrayed Bolton as an unhinged warmonger, which is how many people have described the former Fox News contributor. Carvey said, "It is very important to me that nobody thinks President Trump has handed the keys to the war machine to some sort of hair-trigger lunatic. He then added, "Because if I heard someone say that, I'd blow them up quick!" 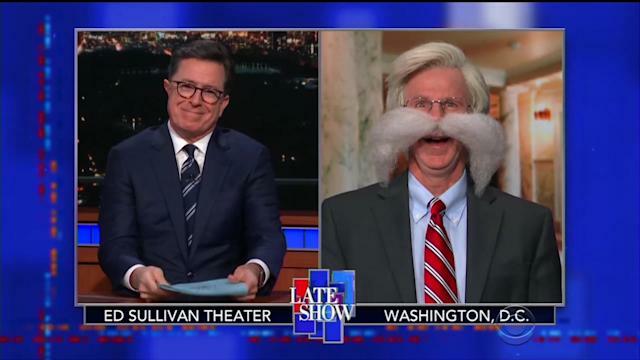 Carvey's antics had Colbert holding back laughter throughout the interview, especially as he continued to upgrade his mustache to more ridiculously large lip rugs. When Colbert asked if his mustache (which Carvey called General Snowball) was growing, Carvey told him, "Oh, yeah. Don't worry about that. General Snowball here just gets a bit engorged when he smells a war coming on."